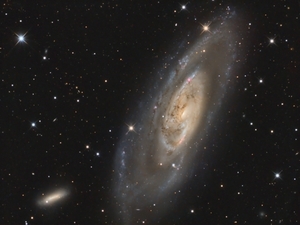 M106 (NGC 4258) is an intermediate type spiral galaxy located at a distance of 23.7 (± 1.5) million light years in the constellation of Canes Venatici. 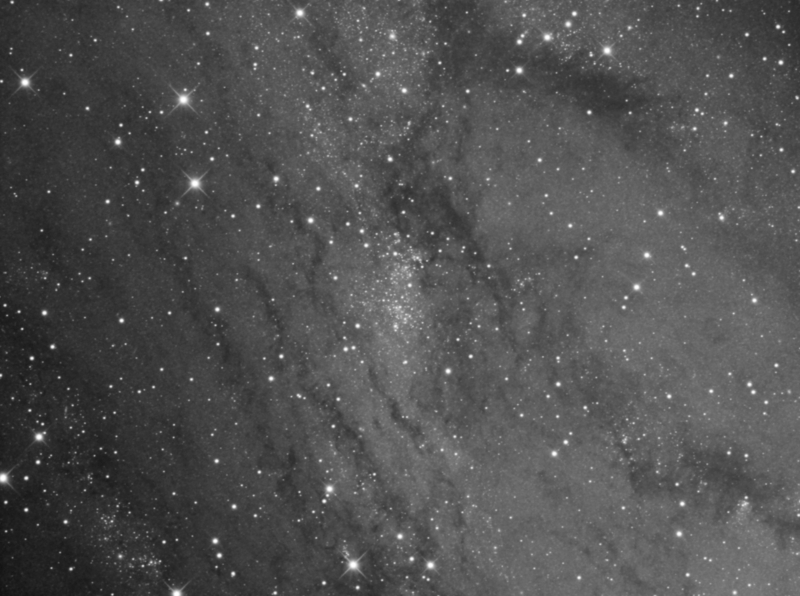 Also shown in this frame is the small spiral galaxy NGC 4248 (lower left of frame). 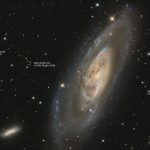 M106 was discovered by Pierre Méchain in 1781 and has an active nucleus and is one of the best known Type 2 Seyfert galaxies. It also is host to a water vapour megamaser that is visible in the 22GHz frequency of ortho-H20 (water molecules where the spins of the two hydrogen atoms are aligned). 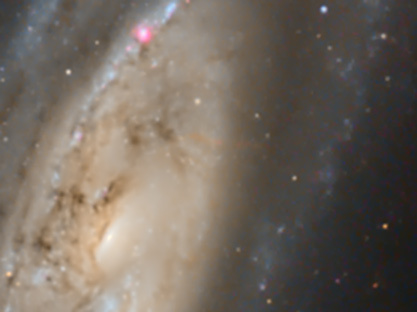 M106 also has significant hydrogen emission around the core – one of the brighter “jets” is just visible in the close up (at 150%) – taking hydrogen alpha data would show this up to a much greater extent, but this is something that will have to follow later when skies are clear! Burbidge found that these objects were in fact quasars, with redshifts of 0.39 (J1218+472) and 0.65 (J1219+473). Burbidge, who worked closely with Fred Hoyle, argues (as does Halton Arp in a later paper), that the association of these QSOs with M106 is not accidental, and that the redshifts arise from the ejection velocities of the objects from the host (pretty quick!). 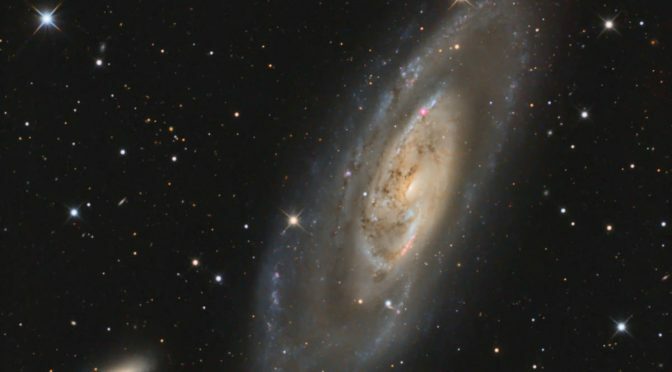 All three scientists were strong proponents of non-Big Bang cosmologies though, so you may detect a slight bias here: later work (eg , http://iopscience.iop.org/article/10.1086/309327/pdf) appears to suggest one of these (J1281+472) is associated with a cluster at redshift z~0.3, and that X-Ray luminosity and cluster temperatures are entirely consistent. So, this may well be a case of line of sight. 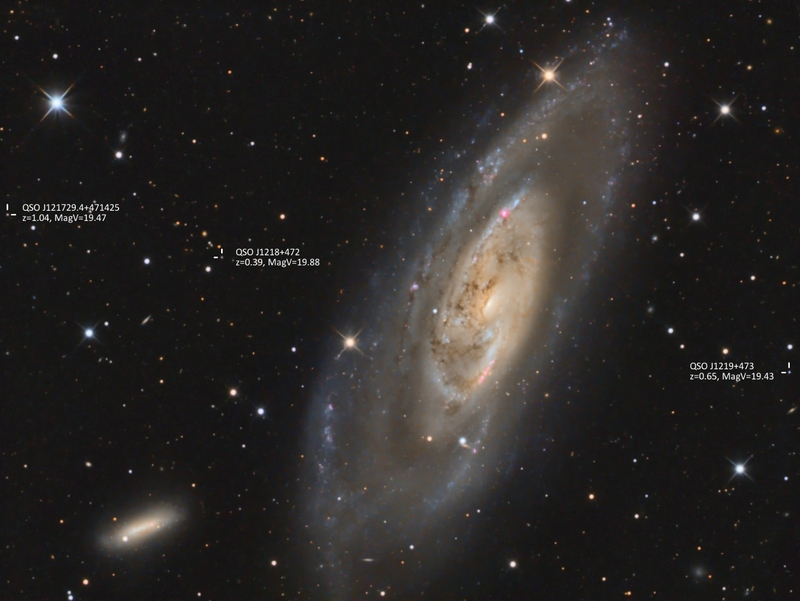 In the field as well (see the image, left), is a further QSO with redshift ~1.04 – theory places this at around 8Gly in a flat cosmology. The luminance data on its own is shown below. The Pleiades open cluster in Taurus is one of the brightest and most recognisable objects int he winter sky. As a first LRGB image using the 14″ Newtonian, and to test the setup of the off-axis guider, I imaged the area around Merope (23 Tau). This was also the first use of a Bahtinov mask that I got laser cut by Oxford Hackspace. The focusing mask works excellently – this should be a real plus, especially for any planetary/lunar work. 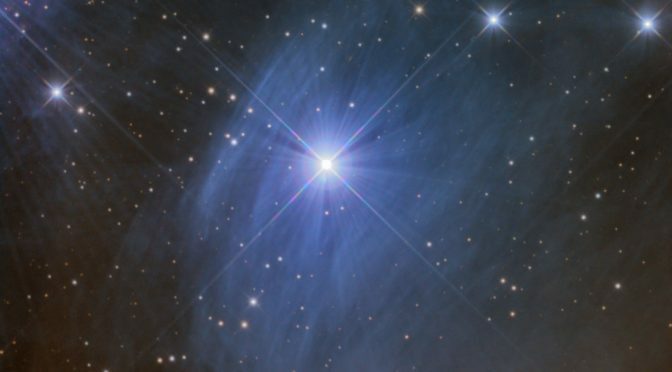 The particular area of nebulosity imaged here around Merope was discovered by Wilhelm Tempel on October 19th, 1859, and is catalogued as NGC1435. 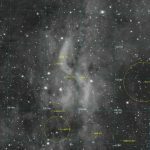 The dust isn’t in fact the nebula from which the cluster formed, rather that the Pleiades happen to be travelling through a particularly dense part of interstellar medium. 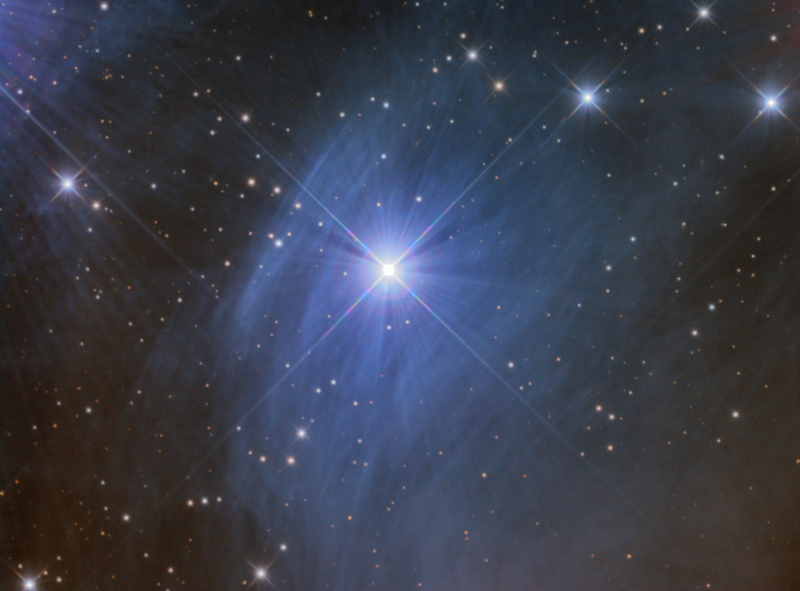 This dust scatters blue light from the cluster members, resulting in the reflection nebula visible to us. The image shows strong diffraction spikes from the secondary spider, as would be expected. 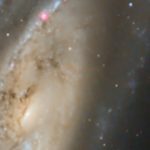 There’s also further diffraction visible around the brightest stars dark shadowing present at 60 degree angles, which is the result of the mirror retaining “clips” (they are not actually clips – they are part of the cell in the case of the 9 point Orion Optics mirror cell). To remedy this would require a mask to be added over the outer edge of the mirror to cover these over – this is maybe something I’ll think about making in the future to help deal with tricky situations like this! 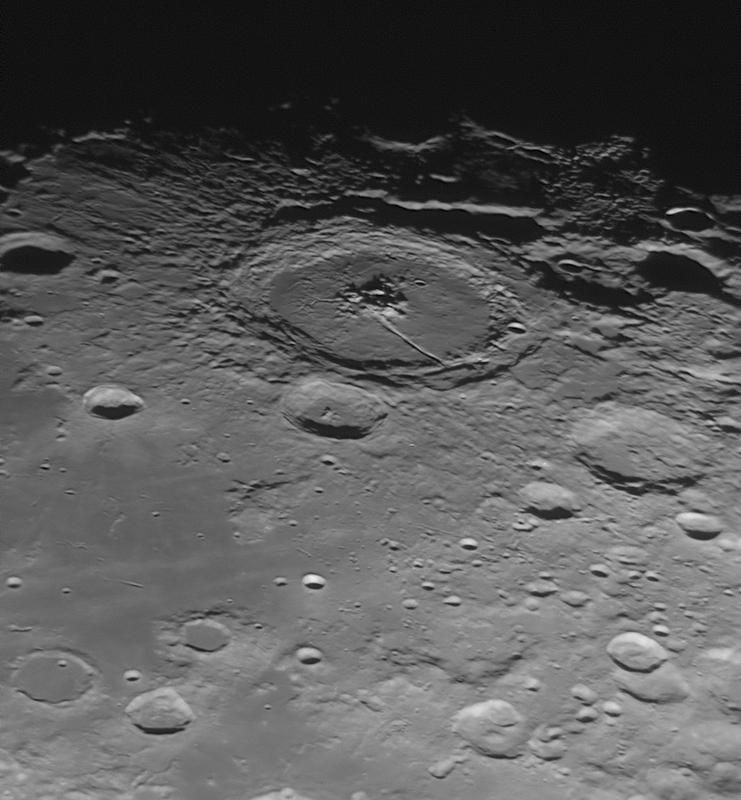 The additional dark shadow pointing to the right appears to be the focuser drawtube intruding on the internal light path inside the scope – that’s probably something that can only be cured by either a shorter drawtube, or shortening the truss tubes. Again. 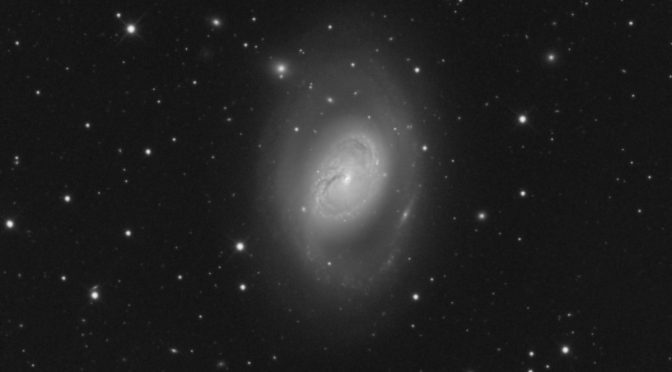 Maybe I’ll wait in case I decide to change coma corrector at some point, in which case it’ll probably need a change to the focal plane position anyway. 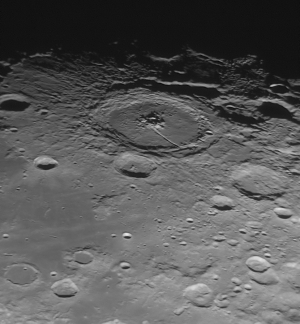 The image was taken on the evening of the 7th Jan 2018 through the 14″ (350mm) Newtonian, with an ST2000XM and an MPCC v1 coma corrector. 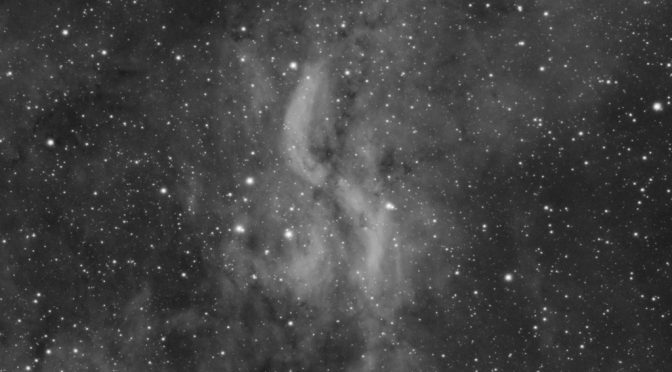 Total exposure was “only” 2h 32m (L: 59m (20x1m, 13x3m), RGB: 31m (10x1m, 7x3m) each channel). Processing in Pixinsight and Photoshop CS4. IC1396 is a very large region of HII emission located in the Milky Way within Cepheus, which spans over 5 degrees of sky. 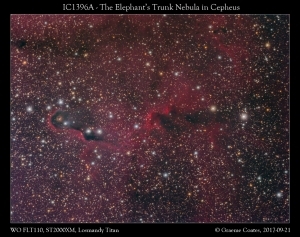 Within IC1396, to the western side, is the Elephant’s Trunk Nebula, known as IC1396A, and VdB 142, which is a reflection nebula at the end of the “trunk”. IC1396A itself is a dense globule of gas and dust that appears to be lined by bright pink emission from atomic hydrogen. This emission is due to excitation by the giant triple star system HD 206267 (off field to the left). The globule appears to be an area of star formation, and contains two young stars in the head of the globule that have created a cavity by the action of their own stellar winds. These F-type stars provide the illumination for the rare yellow reflection nebula seen in the head of the globule, as well as the radiation causing the pink hydrogen emission within the cavity. The combined action of HD 206267 and the two young stars has resulted in areas of high compression in the nebula, triggering the formation of protostars. 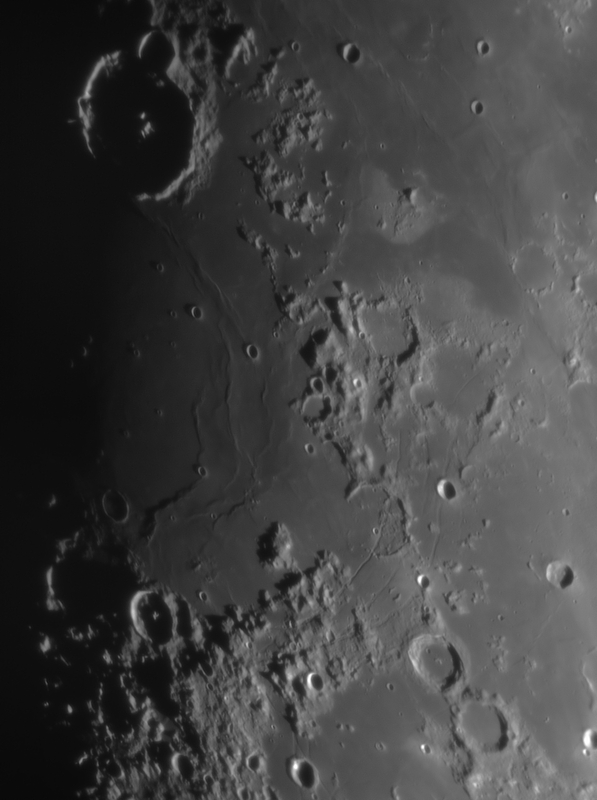 Taken using a WO FLT110 @ f5.6 with SBIG ST2000XM, on Losmandy Titan. 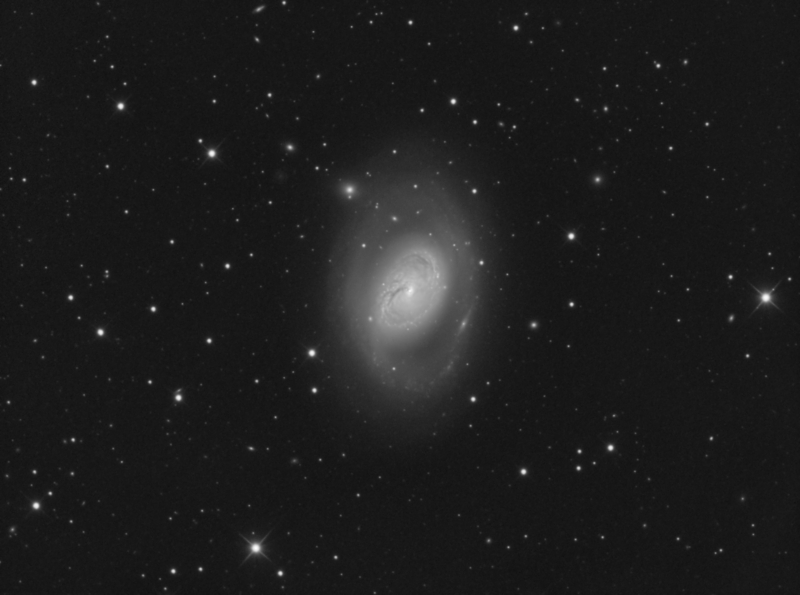 Processing was performed in Pixinsight – control over the star sizes is tricky here, and I may try and improve on this later. 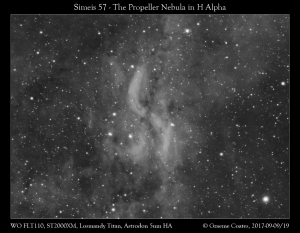 There’s also a (relatively) small amount of data used here – this is certainly a subject that would benefit from adding more exposure (which may also help with star control), as well as H-Alpha data to increase signal and contrast in the emission nebula areas. 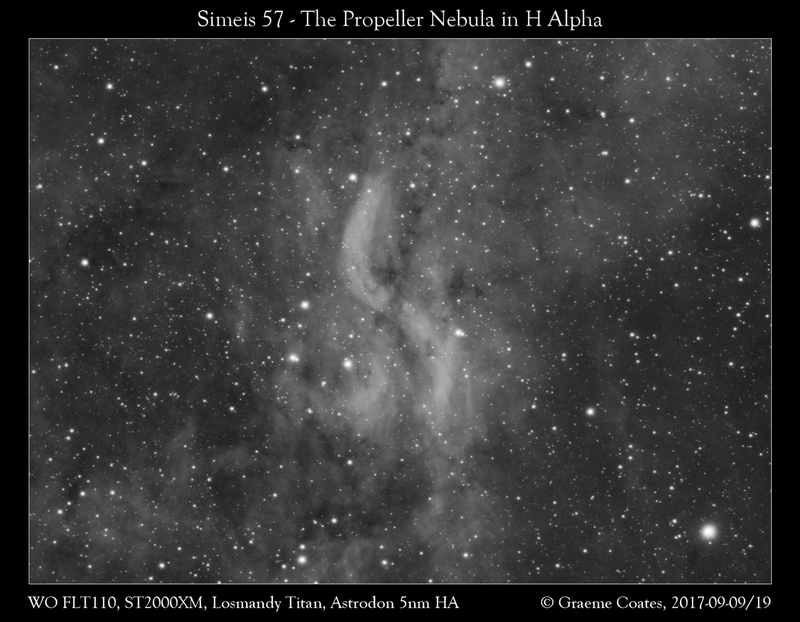 I had opportunity on the 19th/20th September 2017 to add another 3h40m of exposure to my previous image of the Propeller Nebula (Simeis 57/ DWB111/119) – see “A Crescent and A Propeller” for the previous version. 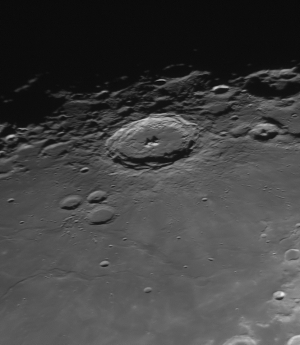 Here is the reprocessed version of the data, taken through an H Alpha filter, which is centered at RA: 20h 16m 08s, DEC: +43° 40′ 42″ (plate-solve from nova.astrometry.net). The extra time on this subject has brought out some of the fainter background nebulosity and enhanced dark nebulae in the field. 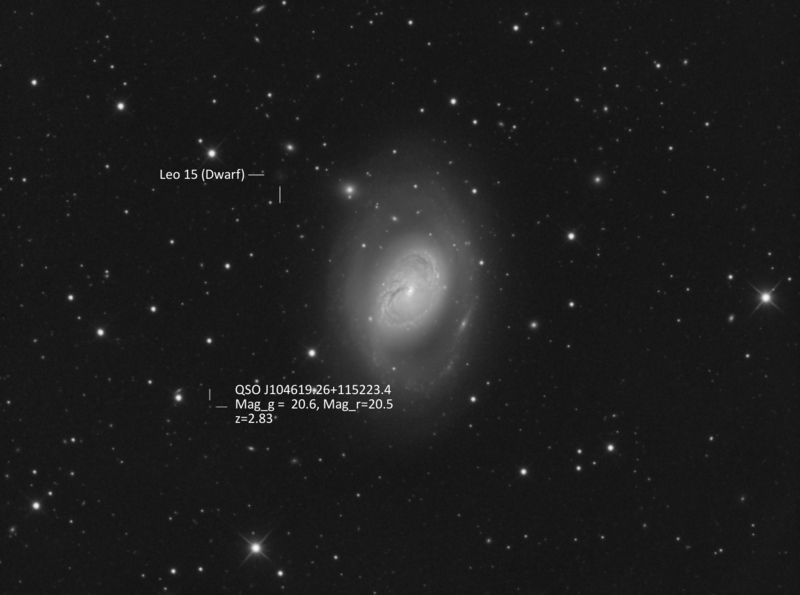 The image at left is an annotated image (using the Image Solver and Annotate Image scripts in Pixinsight). 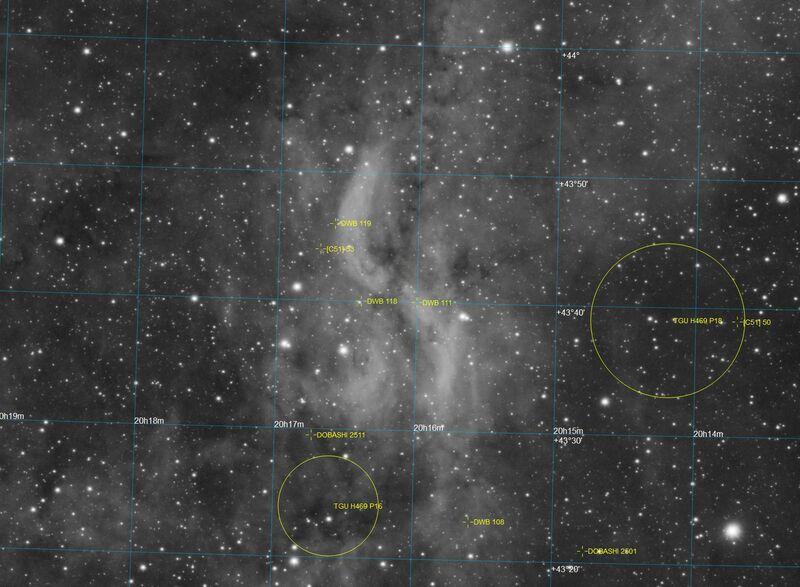 As shown, the Propeller itself is catalogued as DWB111 (south) and DWB 119 (north), with DWB118 representing the surrounding nebulosity, with DWB 108 further to the south below the southern “prop”. 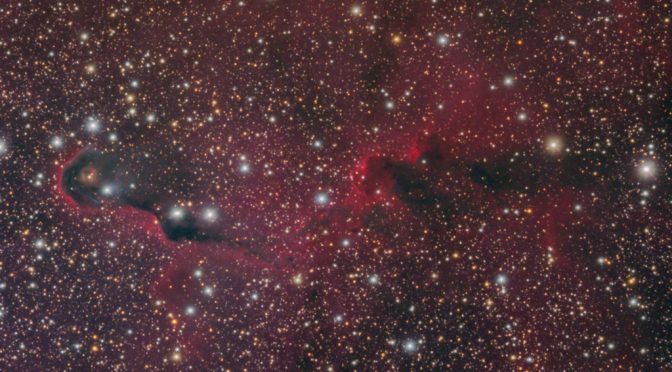 There are a few catalogued dark nebulae in the field – Dobashi 2501; Dobashi 2511/TGU H469 P16 which sits between DWB118 and DWB 107 (off field to lower left); and TGU H469 P18 to the west of the main nebula. For more information about this region, and pretty much the only bit of published research I can find on it(! ), see the paper “Israel, F.P. , Kloppenburg, M., Dewdney, P.E., Bally, J. 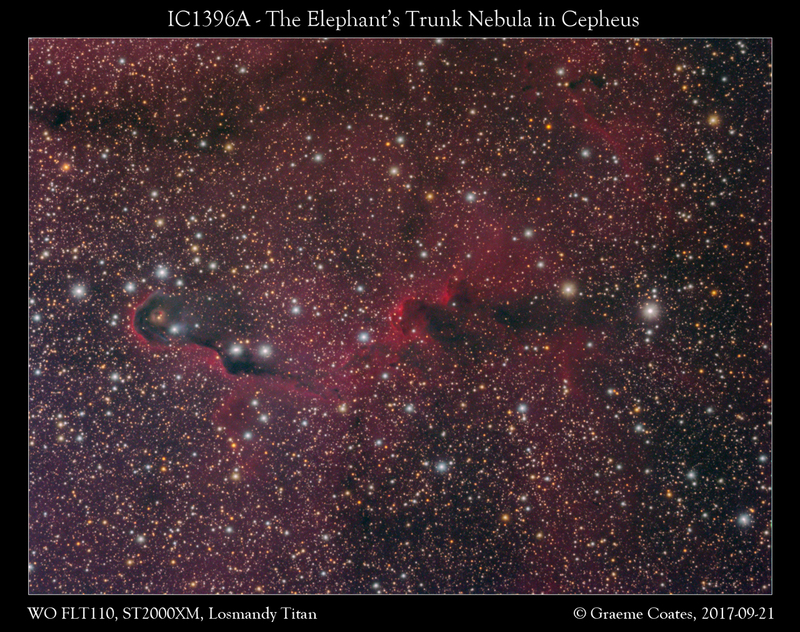 (2003), The peculiar nebula Simeis 57, Astronomy and Astrophysics, 398, 1063 – 1071“. All data was taken from West Oxfordshire on 9th/10th and 19th/20th September. William Optics FLT110 @f5.6 on a Losmandy Titan, SBIG ST2000XM CCD and an Astrodon 5nm HA filter.